Three Judge Bench of the Apex Court in SHYAM LAL VS. DEEPA DASS CHELA RAM CHELA GARIB DASS held that a self-cultivating tenant in Punjab who is in possession of the leased premises beyond lease period cannot be evicted by the Landlord without establishing proof of any conditions specified in Section 9 of the Punjab Security of Land Tenure Act, 1953. The Supreme Court in State of Gujarat vs. Jayrajbhai Punjabhai Varu observed that the trend of accepting dying declaration which supports the prosecution alone and rejecting innocent dying declarations is extremely dangerous. Sahara group chief Subrata Roy secured a huge relief from the Supreme Court on Monday when it extended till August 3 the parole granted to him on humanitarian grounds following the death of his mother. But there was a rider. There was a strict condition that he will have to deposit the balance of Rs 300 Crore, out of the Rs 500 Crore promised by him. Apex Court Bench comprising of Justices Anil R. Dave and R. Banumathi held that the Securities Contracts (Regulation) Act, 1956 (SCRA) is a special law to regulate the sale and purchase of shares and securities and hence it prevails over the provisions of the Indian Contract Act, 1872 and Sale of Goods Act, 1930. 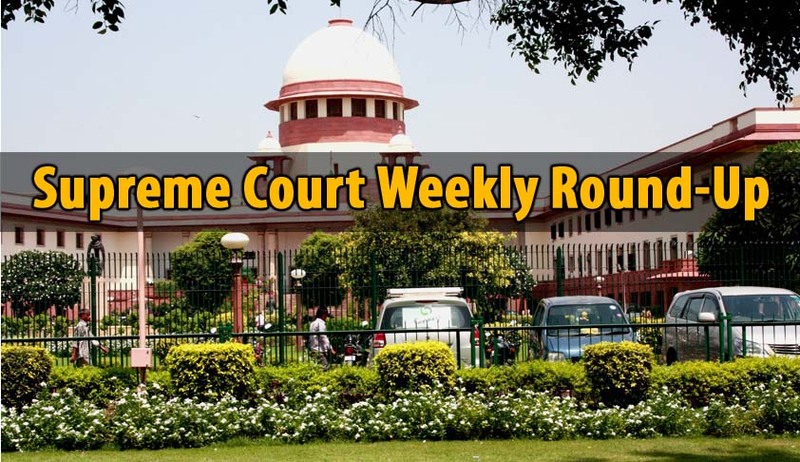 Confusion about working and non-working days cannot save limitation to file a suit, the Apex Court observed while allowing an appeal (AJAY GUPTA VS. RAJU @ RAJENDRA SINGH YADAV) against an ‘interesting’ High Court judgment on limitation. The Apex Court upheld a Gujarat High Court Judgment which had refused to interfere with the findings of disciplinary committee which had held a Judicial officer guilty of misconduct, for having awarded a sentence of imprisonment less than the minimum prescribed by the statute, while he was serving as a judge. Apex Court bench comprising of the Chief Justice T S Thakur and Justice Dr D Y Chandrachud however modified the order of dismissal to that of compulsory retirement. Three Judge Bench of the Apex Court issued detailed guidelines for proper implementation of the High Security Registration Plates (HSRP Scheme). The Bench headed by the Chief Justice of India Dr. T.S. Thakur disposed of Contempt petitions which had highlighted the issue of implementation of HSRP Scheme. The Supreme Court on Monday issued notice to the Centre on a petition filed by ex-servicemen which sought implementation of One Rank One Pension “as formulated by” the UPA-2 government saying the present government had diluted the policy. The special three Judge bench hearing the sensational Nirbhaya case in the Supreme Court headed by Justice Dipak Misra on Monday asked the lawyers of accused and the prosecution to be ready with their arguments on July 18 and said it will even extend the working hours to 6PM on that day in the interest of a detailed hearing. A bench headed by Chief Justice TS Thakur issued notices to the Centre, National Commission for Minorities on a PIL which sought setting up of State Minority Commission in Jammu and Kashmir for proper identification of religious minorities like Hindus, Sikhs, Budhists and Christians and disbursement of benefits of central and state welfare schemes to them. A three judge bench headed by Chief Justice T S Thakur on Wednesday finally referred to a constitution bench, the hearing of a plea to set up National Courts of Appeal in cities like Kolkata, Mumbai and Chennai to hear appeals from high courts. The Apex Court on Thursday witnessed some serious exchange between the Three Judge Bench and Attorney General of India MukulRohatgi on NEET ordinance. The Bench headed by Anil R. Dave reportedly told the Attorney General that NEET ordinance was ‘unwarranted’ and not in ‘good taste’. The Bench however, did not grant any interim stay in the matter. A two Judge Bench of the Supreme Court of India on Friday issued notice to Jayalalitha Government and the Centre in a Criminal Writ Petition filed by DMDK Leader Vijayakant seeking quashment of Defamation Case filed against him by Tamil Nadu Government through Public Prosecutor. A defamation case was filed against Vijayakant by the government, following his remarks on the Aavin milk scam.